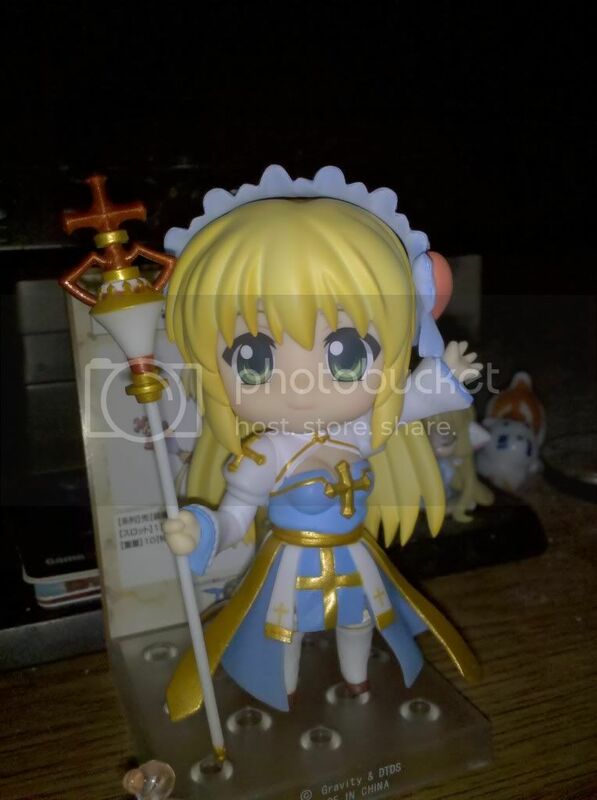 So, anyone remember the Arch Bishop nendoroid figure thing they had back last Christmas? And the delay it took in getting them? And the promise of compensation? Then the forums died for a month and Gravity wasn't answering questions on their FaceBook? Who all got one? What was your compensation for the delay? I'm curious because I've been going back and forth with Gravtiy on this and wanted your input. When I ordered the figure I got the code for the heart ribbon headband in an email. And I redeemed it. We were promised some kind of compensation for the delay. When the figure arrived three months later I opened the box to find... the figure and a slip of paper with a second heart ribbon headband code. You can't trade or sell the things. So what good is two of them to me? Am I suppose to give the code to someone else? But then that's not compensating me, is it? Well, she's cute at least. You can sell them. I don't know much about the actual item or whether its tradeable so you'd have to check into that. But even if not you can sell the code and some have been selling theirs. But also iRO Staff said they would be doing some sort of exchange for a different rare headgear at a later date sometime if you wanted to wait for that. Oh, thank you for that. It's been difficult to find any information relating to the figures since the forums broke. You should be able to trade the hat... If not that will get remedied. Greetings from the WarpPortal Support Team. Thank you for sending us your gaming inquiry. Please be advised that the said item is not tradeable. You may keep the item as compensation for the delay of the ArchBishop figurine. If you have other concerns, please feel free to send a new ticket and we will be happy to assist you. Thank you for clearing this up, Hiem. Ah, not sarcasm by the way. Edited by MizunoAoi, 19 April 2011 - 10:45 PM. I read this web comic, there's a guy in an office and his keyboard broke, so he went to IT which is literally next door. Office guy explains he needs a new keyboard, you can also see a new one behind the IT guy. IT guys says "File a support ticket", Office guy is annoyed, but goes and does it. We see an image of the world, the support ticket being sent around. IT guy gets a notification "Support Ticket #0354 - Office dude needs new keyboard"
IT guy walks over to Office guy with a new keyboard. Edited by AtlasThunderbeef, 20 April 2011 - 03:54 AM. Well no offence to Scher, customer support is a tough job that I don't envy. But once I sent in a ticket saying that I couldn't interact with NPCs in Battlegrounds (I could escape if I stepped on a Warp Portal then Alt+F4ed and reopened the game, but re-entering BG I couldnt click NPCs again). And they responded "Do /where to tell us the map". As if there was more than 1 Battlegrounds in the game. I just found that kinda funny. It was cool how fast they responded though (and luckily it somehow resolved itself anyway though I had tried relogging/rebooting like 5 times previously). Edited by soudou, 20 April 2011 - 04:32 AM.